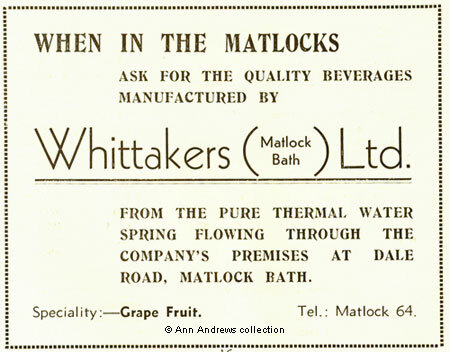 Medicinal drinking water from Matlock Bath's springs was, for several centuries, acknowledged as beneficial to health. Mary Whittaker (1845 - 1920) sold Matlock Bath's water in a slightly different way - she was an aërated water manufacturer. Mary was the Whittaker of Whittaker's pop, "Tordale" and the bottling plant on Matlock Bath's Dale Road. She was born on 26 March 1845 and christened at Bonsall on the 11 May, one of the daughters of John and Priscilla (nee Carpenter) Wheatcroft who lived at Scarthin for some years before moving to Matlock Bath. Mary married John Whittaker, son of Saul Whittaker, at the age of nineteen. Her husband came from Childerditch near Brentwood in Essex. Their marriage took place at St. Werburgh's in Derby on 27 February 1864 and they began married life living in Derby where John was a policeman, but they eventually returned to live in the Matlock district with their children shortly after the 1871 census. John had a number of different jobs before he married, including a spell in the 20th Regiment of Foot which he joined on the 16th March 1958 at the age of 22; he possessed a good conduct badge from his Army years. He was discharged over four years later as he became unfit for service. The family lived first at Starkholmes before moving close to the Heights of Abraham when John changed occupations and started to make and sell ginger beer. By 1881 soda water had been added to the list of items for sale. John Whittaker, two of the couple's sons (William and John) and his father in law were all employed in the family business in 1881. Other sons joined as they became old enough. In Kelly's 1876 and 1881 Directories John, as Manager, was advertising the Matlock Bath Mineral Water Co. Unfortunately, like so many small traders reliant mostly on summer trade, the business encountered problems and in 1883/4 the Company was struck off the Register of Joint Stock Companies and dissolved. Not that the announcement seems to have done any lasting damage as Mary seems to have taken over after this point, dealing with the public face of the business such as advertisements placed in the Trades Directories, registering their Trade Mark (shown below) or dealing with various applications to the local courts. However, according to later census returns, when they were living at Derwent House in the Dale, John was still running things. Interestingly, during a 1901 court appearance Mary stated that "her husband worked on the premises but had no interest in the business". At the time she held an Excise wholesale license to sell beer and stout in casks but wanted to sell her products in smaller quantities as there was a demand for that. She hoped to sell it in six half pint bottles and pledged that she would not sell either in jugs or draught. She had erected premises for bottling purposes at a cost of £400 and was the only bottler in the Matlock Bath district. There was no facility for drinking, and no bar or counter for serving drinks. Nevertheless, her application was refused. By 1901 Derwent House had been extended. Mary had also run the Dimple Stores for a time; her application for an off licence there had been granted in 1890. Despite the velvet gown and beautiful lace collar in this photograph, Mary Whittaker was unafraid of hard work and the family say she drove the delivery dray. Mary is also often listed as a boarding house keeper, which was a fairly common business for people to run as a side-line to perhaps boost their income. John Whittaker died in 1904, aged 71, and Mary continued in business assisted by some of her sons and eventually the brand of "Tordale" came into being. It was difficult for her during the First World War as two sons, Arthur and Ernest, enlisted. If a third son, Oswald, had joined up then she would have been forced to close part of the business down. It recently come to my knowledge that some person or persons have maliciously circulated amongst my customers a report asserting that I use the water from the River Derwent for the manufacture of Aerated Drinks. Such report is entirely false, as I have the sole use of a Mineral Spring emanating from the Heights of Abraham. I hereby give notice that anyone furnishing me with information that shall lead to the conviction of such person or persons will receive £1 reward. Notice inserted in the local press refuting malicious rumours about the water quality, 1885 (copy of). Note that the business changed its name after the original company was struck off. Not everyone thought the bottling plant's buildings enhanced the Dale. At the beginning of the twentieth century J. B. Firth wrote: "Matlock and Matlock Bath are steadily being ruined ... for a few yards, Matlock Dale is unspoilt, but we no sooner pass round the bend [just past High Tor] than we are saluted by the brick chimney of some paint works, while just at hand is is a manufactory of some ginger beer, and a little way beyond is the familiar reek of gasworks." Whatever the merits of the buildings, the businesses provided employment for local people. However, the paint works certainly did spoil things as the colour of the river changed! Mary died on 15 September 1920 is buried in the same grave as John at St. Giles' church. Whittakers pop and "Tordale" Lemonade outlived them both and the business they had worked so hard to keep going continued on Dale Road until the early 1970's. Mary sold the business before she died and it was reported that Whittakers (Matlock Bath), Ltd., had been registered on 18 August 1920 with "a capital of £20,000 in £1 shares, to acquire the freehold premises in Matlock Bath, known as Derwent House, and shops and works adjoining in the occupation Mrs. M. Whittaker, and the goodwill of the business carried on by her as a mineral water manufacturer and bottler of beer and stout; to act as bottling agents for Bass & Co. Ltd., Worthington & Co. Ltd and Guinness and Co. Ltd.". In November, under instructions from Mary's executors, Hodgkinson & Son advertised Derwent House for sale along with her household furniture, her stock in trade of Blue John, Inlaid Black Marble and other items she sold in her shop. The Whittaker name lived on. 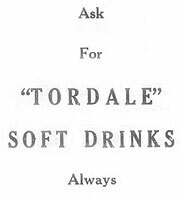 The Matlock Mercury reported, in the edition of 8 Jan 1966, that "Tordale Soft Drinks Ltd had been purchased by an 'industrial combine' ". In the 1970s the Ministry of Transport objected to access onto the main road (the A6), although it hadn't caused a problem before then. As the buildings could no longer be used they were pulled down and hundreds and hundreds of old bottles became available to collectors. Undoubtedly, J. B. Firth would have been pleased that the bottling plant has now been demolished. These days Whittaker's pop is still in demand in a roundabout way as the bottles are regularly to be found being auctioned on E-Bay. Below, right, is a copy of the registration of the Trade Mark registered by Mary Whittaker, Matlock Dale, Matlock Bath, Aërated water manufacturer, in Class 44 (Mineral & Aërated Waters, Natural & Artificial), No.41,575 on 17 Dec 1884. The original is about 1½ inches (about 4cm) square. 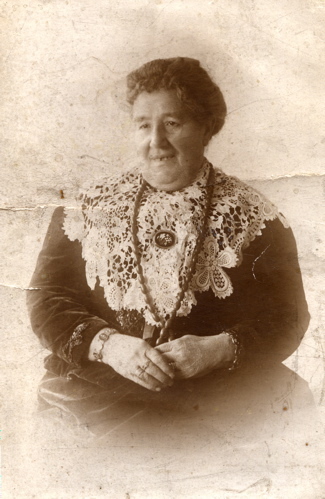 Image of Mrs. Whittaker supplied by and Copyright © Jean Baloo. Intended for personal use only. 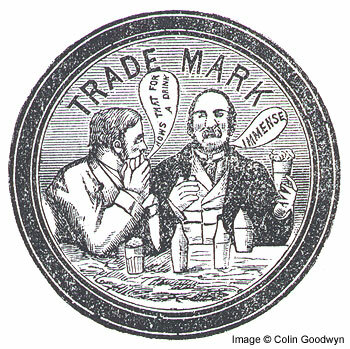 Image of and information about the Trade Mark supplied by and Copyright © Colin Goodwyn. Advertisements © Ann Andrews collection. Mary was with her parents at the time of the 1851 Census. Mary's parents were still living in Scarthin in the 1861 census. They had married in Hampshire in 1840. By the 1871 census they had moved to Matlock Bath. Parish registers. Matlock Bath's register shows the baptisms of John and Mary's children and the various occupations of their father. John Whittaker was a Derby policeman in 1864 and a Starkholmes policeman in 1871. By 1876 he was a labourer, in 1880 he was a ginger beer manufacturer and by late 1881 was a soda water manufacturer. elder children were born in Derby; William was born at Pear Tree, John at Normanton and Mary in Derby (this information from the 1871 census and GRO records). WO97 Chelsea Pensioners British Army service records 1760-1913. No 113, Private John Whittaker. John and Mary Whittaker were living in Matlock Bath in the 1881 Census. Mary's parents were also in the village - see their 1881 census entry. See John Whitaker's [sic] name in Kelly's Directory, 1876 (under Matlock Bath Mineral Water Co.). He also advertised in Kelly's 1881 Directory. London Gazette, see onsite extracts for 1883 and 1884 (Matlock Bath Soda Water, Lemonade, and Aërated Water Company Limited). Mary Whittaker advertised in Kelly's Directories of 1887, 1891, 1895 and 1899, 1908, 1912 and 1916. 1891 Census entry and 1901 Census entry. John had died before the 1911 census. "Derbyshire Times and Chesterfield Herald", 31 August 1901. Annual Brewster Sessions. "Derbyshire Times and Chesterfield Herald", 12 July 1890. Matlock Police Court, Licenses. She also advertised their Dimple Stores business in Matlock in 1891. Firth, J. B. (1908), "Highways and Byways", pp.391-2, chapter sub-heading "A Spoilt Paradise". See fuller publication details. Date of death extracted from Will Calendars at the London Probate Department in London by the web mistress. Mary's probate details are on this website (scroll down the page to find her). Probate wasn't granted on her estate until almost two years after her death. "Derbyshire Courier", 28 August 1920. New Matlock Company. "Derbyshire Times and Chesterfield Herald", 6 November 1920. Sale notice. Advertisement from "The Matlocks, Derbyshire. Official Guide". Issued by the Come to Derbyshire Association, published 1930s. Information researched by Colin Goodwyn.